With the end of the annual RHS Chelsea Flower show on Saturday, and the masses returning to their own English gardens inspired, it’s worth looking back to the 18th century, to the golden age of botanical exploration and to an artist who was arguably the finest botanical painter in history, Ferdinand Bauer. Now the Bodleian’s Conservation Research department are helping to unravel his meticulous and unusual painting technique. Outside of the natural sciences, Bauer (1760-1826), is little known. However, along with his equally talented brother Franz, he is certainly known to botanists. He has been called ‘the Leonardo of botanical illustration’, and is known in particular for the beauty and accuracy of his illustrations of flowers. Nowhere is this seen more clearly than in the paintings he made for the exquisite Flora Graeca, one of the most rare and expensive publications of the 18th century, and certainly one of the greatest botanical works ever produced. 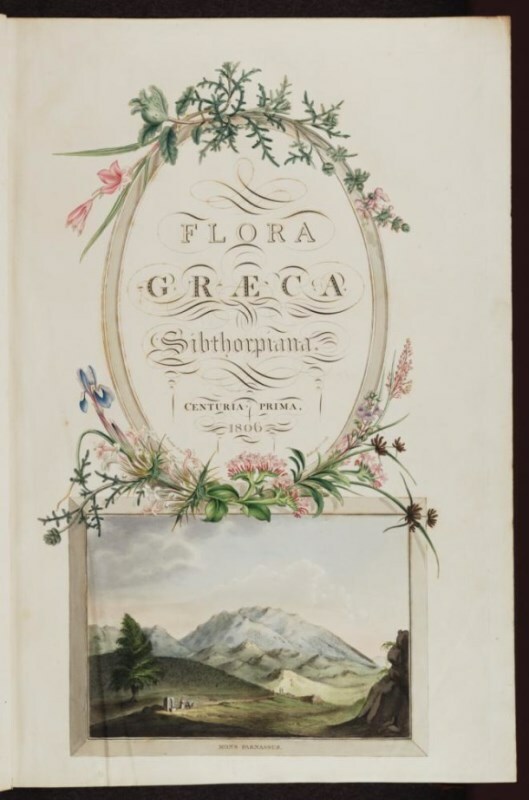 Unprecedented in the quality of its illustrations, its printing and its attention to naturalistic detail, the Flora Graeca described the flowers of Greece and the Levant, and was published in ten lavishly-printed volumes between 1806 and 1840, purchased by an elite list of only 25 subscribers. It was the legacy of the third Professor of Botany at Oxford University, John Sibthorp (1758-1796) who funded much of the endeavour out of his own funds. Sibthorp met Bauer in Vienna in 1786, and immediately engaged him to join his expedition to collect and record specimens, and ultimately to paint the almost 1500 watercolours of plants and animals he sketched on his return to Oxford in 1787. What is of interest to us however is that Bauer used a particularly unusual technique to record his specimens in the field. 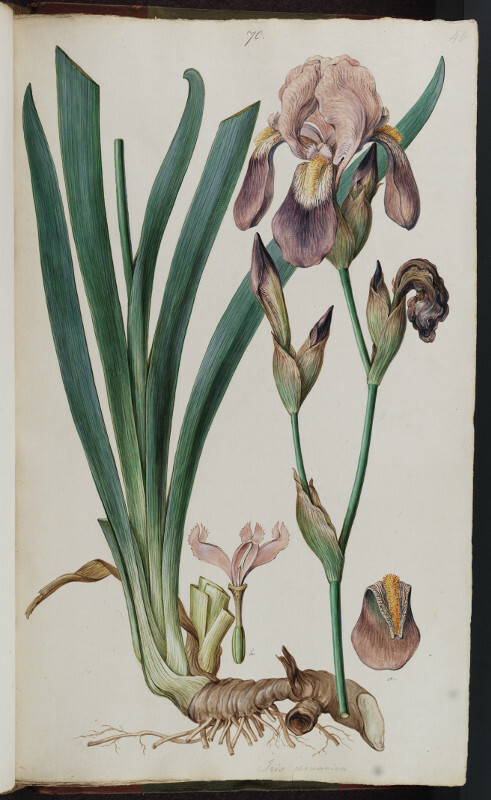 Bauer is exceptional among travelling botanical artists for the unusual techniques he employed for recording colour. He certainly observed and sketched live specimens, but he did not annotate these sketches with colour in the field as other artists did. Rather, subject to the limitations of working in the field – moving from place to place quickly in often difficult territory, and unable to carry large amounts of painting materials with him, he made only very basic outline sketches in pencil on thin paper. He recorded the vital colour information, lost almost immediately after a specimen had been picked by annotating these with a series of numerical colour codes which likely referred directly to a painted colour chart, now lost. That Bauer’s paintings were created using only this colour reference system during his 6 years in Oxford, painting them sometimes up to five years after seeing the original plants, and that they are highly regarded even today for their botanical accuracy, speaks to his expertise as an artist and his astonishing memory for colour. More pertinently, Ferdinand Bauer (and to a lesser extent his brother Franz) appear to be the only significant natural history artists to have used this kind of colour code in a practical way. Numerical codes of up to 140 different colour tones are found on early drawings by both Bauers from the 1770s. 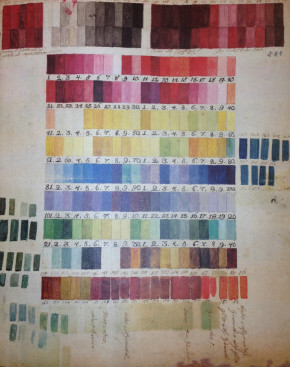 However, where Ferdinand seems to have continued to develop this initial system of some 140 colours into one of at least 273 colours for the Flora Graeca (and from then into a considerably more complex system of 1000 colours for a later expedition to Australia in 1801-5 – though how he could have used this practically is anybody’s guess), Franz Bauer, who was by then official botanical painter to Joseph Banks at the Botanical gardens at Kew, did not did not appear to use the system after he came to London in the late 1780s. Ferdinand of course, spent a significant amount of his time working in the field, and therefore much more in need of a system of shorthand than his brother. 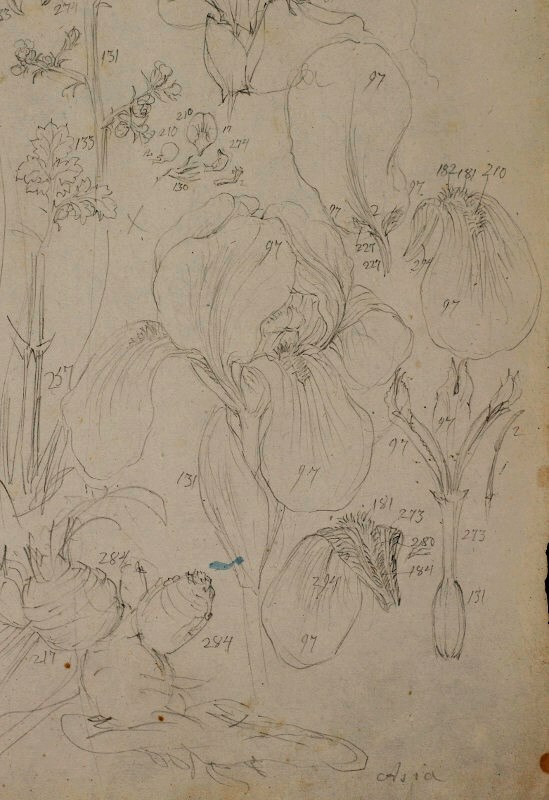 However, it’s interesting to note that no other travelling botanical artist used such a system to the extent that Bauer did. An early colour chart (below) that appears likely to have been used by the brothers was found in 1999 at the Madrid Botanical Gardens, but Ferdinand Bauer’s 273 colour chart from the Sibthorp expedition and the 999 colour chart he may have used for the Matthew Flinders expedition to Australia, if they ever existed, have never been discovered. Colour chart (c.1770s) discovered in the Archives of the Botanical Gardens in Madrid in 1999, and likely to have been used by the Bauer brothers © Archivo del Real Jardín Botánico, CSIC, Madrid. This fact, however, presents a unique opportunity for us to carry out technical research into Bauer’s materials. 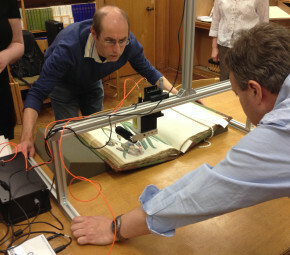 The Conservation Research department at the Bodleian Libraries together with the Plant Sciences Department at the University are working on a three year Research project on Bauer’s techniques, funded by a Leverhulme Trust Research Project Grant. Collaborating with the V&A, Durham University and the University of Northumbria the project aims to understand what the Flora Graeca colour chart may have looked like, and how Bauer might have used it. A large part of the project involves identifying the pigments used by Bauer in his magnificent Flora Graeca watercolours, cross reference these results with the numerical codes in his field sketches, and ultimately create a historically-accurate reconstruction of the lost colour chart. How will we do this? Often it is permitted to remove a minute sample of paint from a work of art in order to identify the material components. However this is rarely possible with works of art on paper, and is most certainly not possible for one of the treasures of the Bodleian’s collection! The work therefore is carried out in situ, bringing portable instruments to the object itself, rather than the other way around. For this we currently use three analytical techniques at Oxford: Raman spectroscopy, X-ray Fluoresce spectroscopy (XRF) and Hyperspectral imaging (Imaging spectroscopy). Durham and Northumbria Universities have particular expertise in Raman Spectroscopy of cultural heritage objects, and Durham has built a portable instrument that is capable of positively identifying many of the pigments that Bauer used. The V&A Conservation Science section has a long history of collaborating with universities on technical research, and also has a great deal of expertise in Raman spectroscopy and its use in identifying pigments on artists’ watercolours. In addition to the excitement of recreating Bauer’s lost colour chart, the project showcases the value of technical art history, a relatively new field that encompasses both scientific analysis and historical research into the materials and methods of the artist. It will go some way toward an understanding of Bauer’s extraordinary feel for colour and pigment, how he utilised his colour code, and ultimately how he was able to achieve such an impressive degree of colour fidelity in his work. As we progress with the project, and as we learn more about Bauer’s materials and techniques, I’ll post again with more results. But should you find yourself in Oxford before September, a copy of both the Flora Graeca, and Bauer’s original illustrations for it are on display in the Marks of Genius exhibition at Bodleian’s Weston Library. Hi Ruth, many thanks for your comment, and I’m very much looking forward to the NSW Library’s exhibition on Bauer next year. Our research essentially aims to unravel Bauer’s code through both scientific anaysis of the pigments he used, and by replicating the original materials and techniques that he used in his watercolour paintings using 18th century sources. Although, as you’ve seen, an early colour chart does exist purportedly by Bauer, it may be that for both the Sibthorp and the Flinders expeditions, there was no physical colour chart, and the code was simply more of a mnemonic device. So far, we have some very promising results deciphering Bauer’s code and understanding how he used his materials in both the Oxford and Australian paintings.This will be published soon, but in the meantime, please feel free to get in touch. I’d be more than happy to share some of our most recent results with you. Interesting post thanks. Looking forward to learning more of your progress and results with the colour chart, as we are exploring the collection of Australian drawings and would also love to work with the colour chart data as part of a wider project.